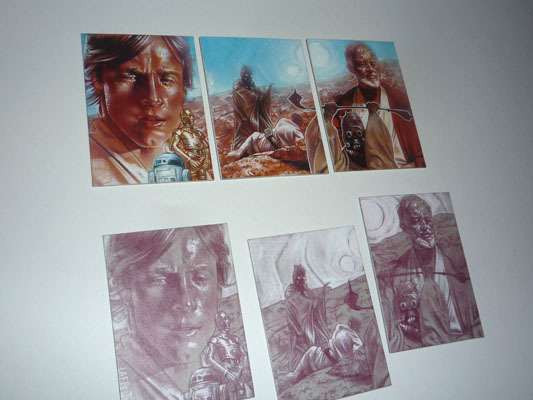 A last look at the Tatooine cards before I stuffed them in an envelope and sent them off to their new home. Sorry I missed the blog post Wednesday, it’s been a hectic week and I actually didn’t have much I could show. I’ve been finishing up a couple cards that are intended as Christmas presents, so I didn’t want to ruin anyone’s Christmas morning by accidently letting the 'cat out of the bag' so too speak and showing their piece on my blog. Crazy! I know, I couldn’t believe my ears when I heard about it. Frazetta’s been a hero of mine for years. I’d like to think there some sort of reasonable explanation for this, but since Frank Jr.’s is now sitting in jail, sporting a $500,000 dollar bond I can’t imagine what it would be.